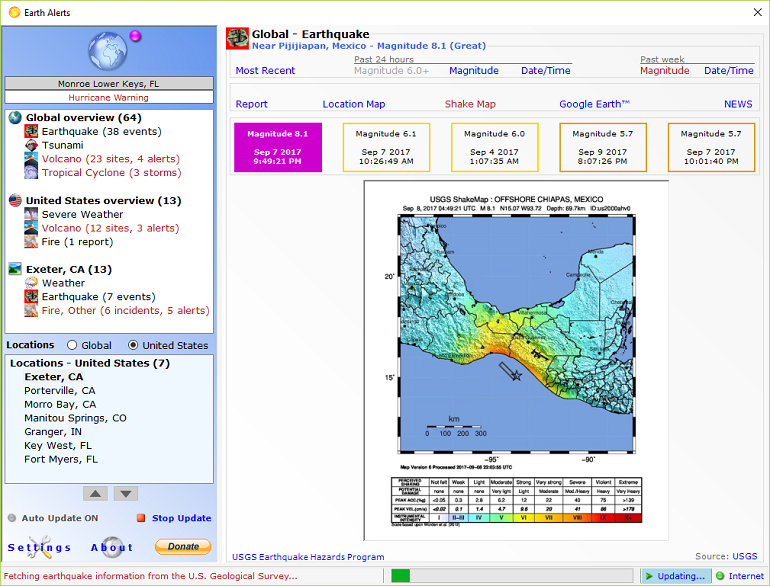 Earth Alerts is an application designed to run on Microsoft Windows that allows you to monitor in near real-time a variety of natural hazard events that are occurring anywhere around the world. Alert notifications, reports, and imagery provide the user with a convenient way to view natural phenomenon as they occur, whether close to home or some far-flung corner of the globe! 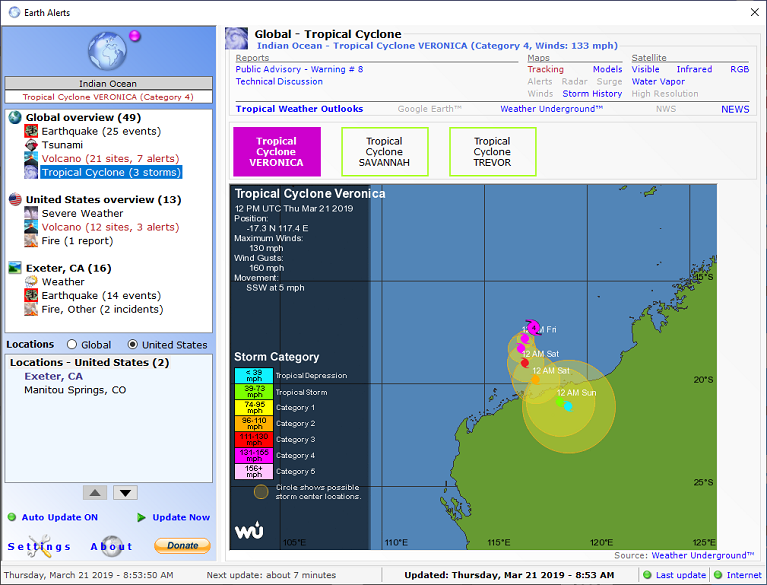 Earth Alerts includes basic weather tracking features such as National Weather Service alerts, current conditions, local forecasts and radar/satellite imagery. Note that this program does not provide the most extensive weather data or "fanciest" weather related imagery compared to what is available online. If weather information is all you're interested in, then Earth Alerts is probably NOT for you. There are many comprehensive applications, web browser add-ins, and websites available for monitoring weather. Guess what? I use some of them myself! I created Earth Alerts to do more than just track weather-related phenomenon. The inspiration for Earth Alerts grew out of an idea to create a single application for monitoring multiple types of natural hazard events. After all, our planet can be quite destructive to us mortals, by offering up dangers in a variety of ways! Earth Alerts is a little program for anybody who is fascinated with the power of nature and enjoys keeping track of what our little blue planet is dishing out on a regular basis! Microsoft Windows 10/8/7: works in both 32-bit (x86) and 64-bit (x64) versions of Microsoft Windows. All earlier versions of Windows are not supported. Microsoft .NET Framework 4.7.2 version or later: If you are running the latest edition of Windows 10 and have automatic updates enabled the newest version of the .NET Framework software (currently 4.7.2) should already be installed on your system. However, if the .NET Framework is not present on your system when you install Earth Alerts for the first time the installer should notify you and automatically install the .NET Framework. 4,658 8,398 ManyJourneys <img src="https://www.oldergeeks.com/downloads/gallery/thumbs/EarthAlertsScreenshot02_th.png"border="0"> Apr 11, 2019 - 12:02 2019.1.70 2.93MB ZIP , out of 26 Votes.